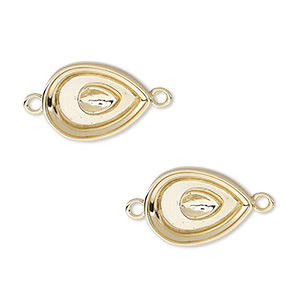 Drop, Almost Instant Jewelry®, gold-plated "pewter" (zinc-based alloy), 20x15mm teardrop with 18x13mm pear setting. Sold per pkg of 2. 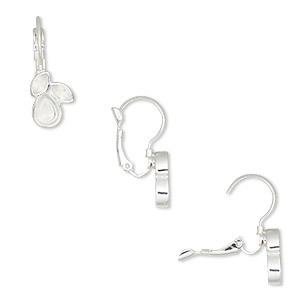 Drop, Almost Instant Jewelry®, silver-plated "pewter" (zinc-based alloy), 20x15mm teardrop with 18x13mm pear setting. Sold per pkg of 2. 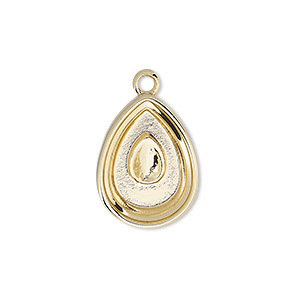 Pendant, Almost Instant Jewelry®, gold-finished "pewter" (zinc-based alloy), 28x12mm two-sided textured teardrop with 14x10mm pear setting. Sold per pkg of 2. 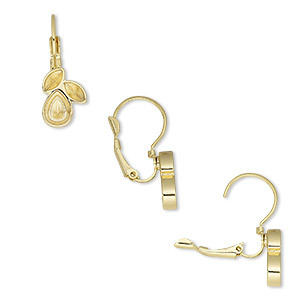 Clasp, Almost Instant Jewelry®, tab, gold-plated brass, 12x10mm teardrop with 8x6mm pear setting. Sold per pkg of 4. 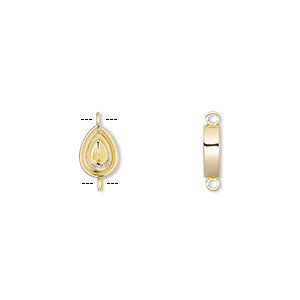 Link, Almost Instant Jewelry®, gold-plated "pewter" (zinc-based alloy), 16x12mm teardrop with 14x10mm pear setting. Sold per pkg of 2. 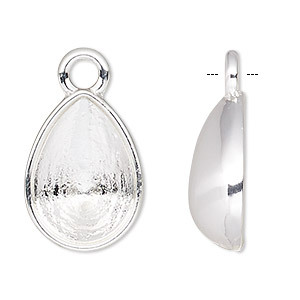 Pendant, Almost Instant Jewelry®, silver-plated "pewter" (zinc-based alloy), 28x12mm two-sided textured teardrop with 14x10mm pear setting. Sold per pkg of 2. 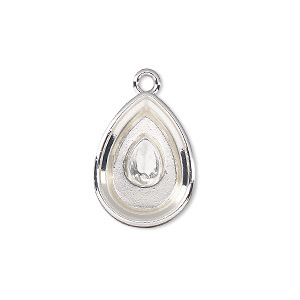 Pendant, Almost Instant Jewelry®, slide, silver-plated "pewter" (zinc-based alloy), 10x7.5mm single-sided teardrop with 8x6mm pear setting. Sold individually. 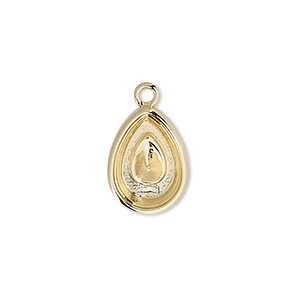 Pendant, Almost Instant Jewelry®, slide, gold-finished "pewter" (zinc-based alloy), 10x7.5mm single-sided teardrop with 8x6mm pear setting. Sold individually. 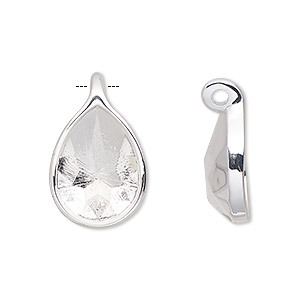 Link, Almost Instant Jewelry®, silver-plated "pewter" (zinc-based alloy), 20x15mm teardrop with 18x13mm pear setting. Sold per pkg of 2. 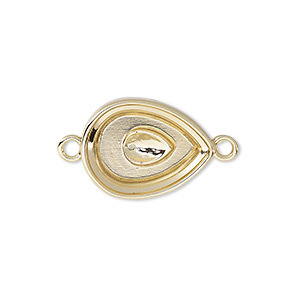 Drop, Almost Instant Jewelry®, gold-plated "pewter" (zinc-based alloy), 11x8mm beaded teardrop with 10x7mm pear setting. Sold individually. 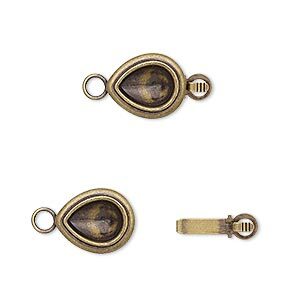 Clasp, Almost Instant Jewelry®, tab, antique gold-plated brass, 12x10mm teardrop with 8x6mm pear setting. Sold per pkg of 4. 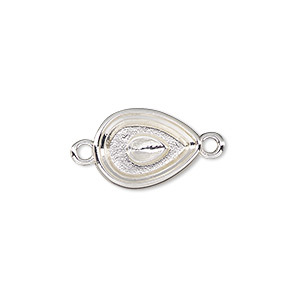 Drop, Almost Instant Jewelry®, silver-plated "pewter" (zinc-based alloy), 11x8mm beaded teardrop with 10x7mm pear setting. Sold individually. 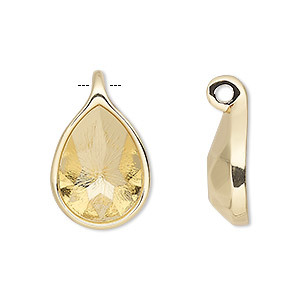 Link, Almost Instant Jewelry®, gold-plated "pewter" (zinc-based alloy), 20x15mm teardrop with 18x13mm pear setting. Sold per pkg of 2. 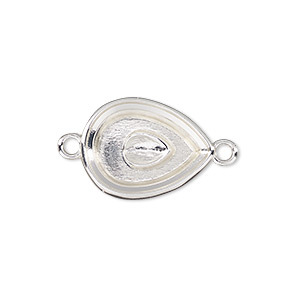 Link, Almost Instant Jewelry®, silver-plated "pewter" (zinc-based alloy), 16x12mm teardrop with 14x10mm pear setting. Sold per pkg of 2. 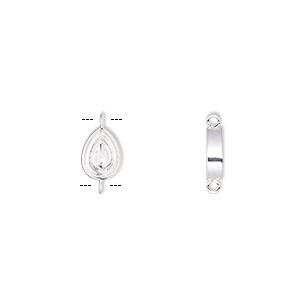 Ear wire, Almost Instant Jewelry®, silver-plated "pewter" (zinc-based alloy), 28mm leverback with 8x6mm pear setting and 6x3mm navette setting. Sold per pair. 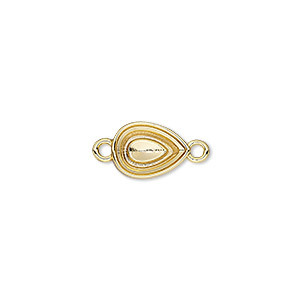 Ear wire, Almost Instant Jewelry®, gold-plated "pewter" (zinc-based alloy), 28mm leverback with 8x6mm pear setting and 6x3mm navette setting. Sold per pair. 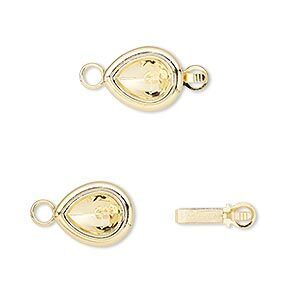 Drop, Almost Instant Jewelry®, gold-plated "pewter" (zinc-based alloy), 24.5x15.5mm with 18x13mm pear setting. Sold individually. 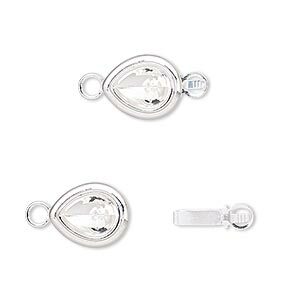 Drop, Almost Instant Jewelry®, silver-plated "pewter" (zinc-based alloy), 24.5x15.5mm with 18x13mm pear setting. Sold individually. 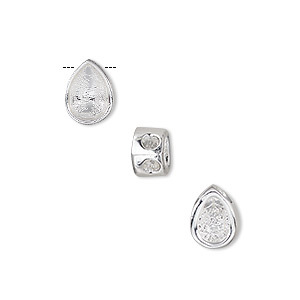 Link, Almost Instant Jewelry®, silver-plated "pewter" (zinc-based alloy), 12x8.5mm teardrop with 10x7mm pear setting. Sold individually. 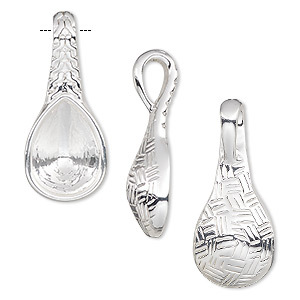 Link, Almost Instant Jewelry®, silver-plated "pewter" (zinc-based alloy), 16x12mm teardrop with 14x10mm pear setting. Sold individually. 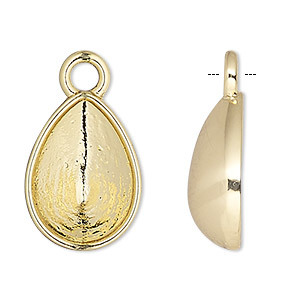 Link, Almost Instant Jewelry®, gold-plated "pewter" (zinc-based alloy), 16x12mm teardrop with 14x10mm pear setting. Sold individually. 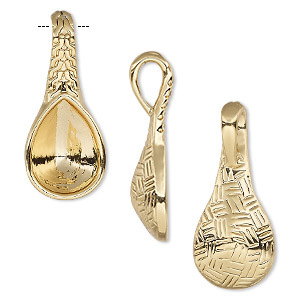 Link, Almost Instant Jewelry®, gold-plated "pewter" (zinc-based alloy), 12x8.5mm teardrop with 10x7mm pear setting. Sold individually. 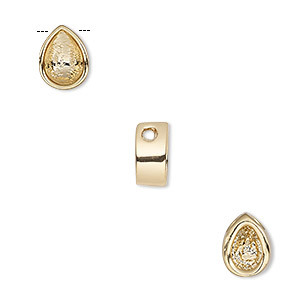 Drop, Almost Instant Jewelry®, gold-plated "pewter" (zinc-based alloy), 16x12mm teardrop with 14x10mm pear setting. Sold per pkg of 2.